US equities market ended the first quarter of 2019 on a very strong note with the S&P500 gaining +13.41%, the best since 1998. It was largely driven by improving trade talks with China, accommodative monetary policy statements coming out of Federal Reserve, and strong economic reports. The key highlight of the quarter was the yield curve inversion near the end of the quarter when the 10 year treasury note’s yield dipped below the 3-month treasury yield. This cause the market to sell off two days in a row because it has historically preceded an economic recession. But the market recovered back to year-to-date high after the inversion went away before the end of the quarter. Information Technology was the best performing sector and it was up +19%. About 11% of the return came from just five companies; AAPL, MSFT, CSCO, V, and MA. The remaining 9% came from semiconductor and software companies. Real Estate was the second best performing sector at +17.51% and four major companies were responsible for ~7% of the return. Though the industrial sector was the best performing sector between February and early March, it ended the quarter in third place at +17%. Boeing stock performance near the end of the quarter played a major role in bringing down sector performance. The company represents a whooping 9% of the sector. On the other hand, healthcare was the worst performing sector at +6.45% followed up by financials at +8.49%; both sectors underperformed the market. Healthcare underperformance was driven by a negative outlook on some of the major industries. As we head into the 2020 election where healthcare is the number one voter issue, market is bracing for a big shake up as a result of increasing rhetoric from the both sides of political spectrums. Lots of key hot topic issues such as universal healthcare and drug pricing are on the agenda list. While pharmaceutical companies and healthcare provides are getting hurt the most, healthcare equipment makers has been able to stay out of the cross fires. As we enter in to the second quarter with earnings season kicking off at the middle of April, one thing to keep an eye on is for signs regarding corporate earnings recession. The current estimate for S&P500 2019 Q1 EPS growth is at -4.2% according to Factset and if the companies report negative earnings growth, it will the first year-over-year decline in earnings since Q2 2016. The energy industry is one of the most volatile sectors you could invest in. One of the most important factors that affect the industry is also one of the most unpredictable: Political unrest. Given the amount of oil that is produced by OPEC of which many members are nations with precarious political positions that are often subject to revolutions or general unrest. Currently, there is one OPEC nation subject to political upheaval that may harm the bottom line of many international energy companies; and that country is Algeria. Algeria is the largest OPEC member by territory and the largest country within Africa. The country achieved independence from France in 1962 and has since then transitioned into an oil-based economy with $22 billion in oil exports per annum and 12 billion barrels of oil in their proven reserves. The oil produced from the country is notably light and sweet, comparable to the U.S. Eagle Ford crude in its sulfur content and only slightly denser. Algeria is a heavily based on their oil earning, with 30% of their GDP and 95% of their export earnings coming from oil, most of which goes into the EU which has been their largest trading partner since 2002. To set the stage for the political unraveling of Algeria, it's important to know that it's a socialist country with citizens used to all-encompassing social welfare programs. The issue with having an oil-dependent socialist country became apparent during the oil crash of 2014. When the global price of oil fell dramatically Algeria faced a drastic drop in revenue, and given the expansive and expensive social welfare programs, Algeria found itself struggling to balance its budget. Oil prices remained low for two more years keeping Algeria in strife. There is a historical basis for the assumption that a drop in oil prices will result in political unrest in Algeria. In the 1980s when oil was still at rock bottom due to the oil glut, Algeria faces countless violent protests due to the lack of money for social programs. In 2019 oil prices had greatly rebounded yet, Algeria found itself in the same situation it was in during the 1980s riots. This is because, although prices have risen OPEC nations have all agreed to cut supply, including Algeria; leaving it with a high enough price to pay for their programs but not enough quantity to sell. Even without the money from their oil exports, the Algerian government declined to shut down the social welfare programs and instead funded them with the money from the country’s foreign exchange reserves. These reserves have since depleted 50% from their 2014 levels; leaving Algeria to begin print money to pay for its social welfare programs. Leading to rampant inflation. Do to the perceived mismanagement of the budget many grassroots protests have since emerged calling for a change in leadership. Specifically calling for the resignation of President Bouteflika who has been in office for four consecutive five-year terms. As of this week, this has been achieved, President Bouteflika has agreed to resign by April 26th. While this may seem to be an end for the political strife in the nation, it is more likely just the beginning as the president has left a not clear successor to take his place. Leaving political certainty at an all-time high. With expatriation of oil reserves being a significant risk given the country’s outspoken and dissatisfied military elite. Now how does this effect, the energy market as a whole? Both major and independent Oil and Gas companies have exposure to Algeria, and as political unrest and instability increases the projects likelihood of projects underdevelopment being halted. One example of this would be Exxon’s plan to develop a natural gas field in Algeria which were halted do to the political unrest. Moving forward it would be wise to avoid companies with significant exposure to Algeria, in either current projects or developing ones until the political unrest has been settled. The March 4th crash of a Boeing 737 Max 8 Ethiopian Airlines flight 6 minutes after takeoff has led to the grounding of the entire 737 Max fleet. This was the second crash involving the 737 Max 8 in the last 6 months. Lion Air flight 610 crashed into the Java Sea 13 minutes after takeoff from Jakarta on October 29, 2018. China was the first country to ground all 737 Max aircraft, followed by the UK, Australia, Canada, and the US. An issue relating to an anti-stall device in the nose of the plane has been linked to the Lion Air crash and recently recovered Ethiopian black boxes show the two crashes have a clear similarity. The 737 Max is a brand new plane and had just been delivered to both airlines just months prior to the crashes. Additionally, a grand jury is looking into safety certifications involving the aircraft. The next few months will be rough for Boeing as the company will be under scrutiny from aviation authorities. The Max program is critical to Boeing as it accounts for approximately 590 jets valued at between $27 billion and $30 billion in revenue this year alone, representing 1/3 of total projected 2019 revenues. A grounding of all 737 Max planes could cost the company between $1 billion and $5 billion, according to estimates from Wall Street firms Melius Research and Jefferies. Shares have dropped 12% since the Ethiopian crash. Fidelity National Information Services Inc. (FIS) agreed to acquire Worldpay Inc. (WP) for roughly $35 billion in cash and stock. The deal will create a global giant with worldwide reach in the payment and back-office financial services sector that will allow the company to reach more customers. FIS engages in an array of tasks ranging from storing and managing basic account information to complex back-office trading operations. Worldpay connects merchants to the networks that process credit and debit card transactions and other types of payments. As retail banks have started to get rid of their traditional payment management services, an increasing amount of smaller, technology-driven startups has filled the void. This has led to an increasing number of new stock-market listings, strategic takeovers and private-equity buyouts in recent years. The combined company expects to generate $500 million in additional revenue and save roughly $400 million by combining their one-stop shop services to process online and in-store payments and manage transactions in multiple currencies. The new company expects to generate $12.3 billion in revenues. Recent discussion of oil prices has revolved around OPEC production cuts, record-breaking US output, turmoil in Venezuela, and the U.S.-China trade dispute. 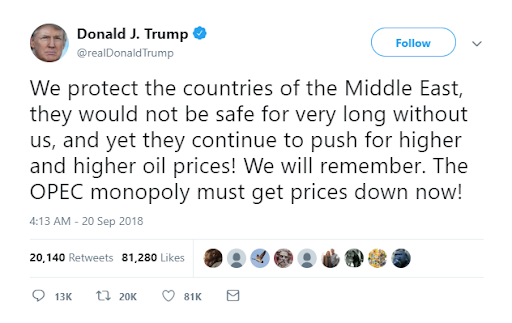 However, U.S. sanctions on Iran’s oil exports will be the key factor that drives the price of oil in the coming months. After imposing sanctions on oil imports in November 2018, the U.S. granted waivers to eight major Iranian oil clients, including the superpowers China and India, resulting in an increase in supply which drove prices down. Benchmark Brent crude futures fell 22 percent that month and the waivers influenced an OPEC decision to agree to cuts beginning in 2019. Looking ahead, analysts believe that the price of oil itself will play a major factor in the decision whether to extend the waivers and demand additional reductions from Iranian oil customers. If waivers are extended, analysts anticipate that India and China will be receiving the go-ahead to continue buying oil and the US will not renew waivers to Italy, Greece, and Taiwan in order to limit the supply of oil. The January 25 Brumadinho dam accident in Brazil that left more than 300 people dead or missing on Jan. 25 has resulted in Vale SA cutting production at an iron ore mine in the state of Minas Gerais that has an annual capacity of 12.8 million tons. It will also suspend operations at its Doutor dam. This is in addition to a temporary closure of its Brucutu mine and other mines in southern states, which were expected to affect 70 million tons a year of production capacity. The news caused Chinese iron ore futures to rise by more than 3 percent to a two-week high on Monday and pushed shares of Rio Tinto and BHP, rivals of Vale, up by 1.8% pre-market on Monday. This is Vale’s second dam disaster in the last 5 years, as the Samarco dam collapse in 2015 caused the deaths of 19 people and irreparable pollution of the entire Doce River basin. The real Gross Domestic Product (GDP) increased at an annual rate of 2.6 percent in the last quarter of 2018, in accordance with the “initial” estimate released last Thursday, February 28th by the Bureau of Economic Analysis (BEA). This initial estimate replaces the “second” estimate that was supposed to be released last Thursday, while initial reports were intended to be released January 30th, a result of the partial government shutdown. The fourth quarter GDP growth rate was down 0.8 percentage points from the third quarter, due largely in part to decelerations in private inventory investment, personal consumption expenditures (PCE), and downturns in federal and state government spending. However, these movements were partly offset by an increase in exports and an acceleration in nonresidential fixed investment. That being said, the actual fourth quarter GDP report was still stronger than the consensus forecast, which was 2.2 percent. The Consumer Price Index increased a total of 1.6 percent, the smallest increase seen since the period close of June 2017, as of the 12-month close in January. The index regarding all items rose 2.2 percent over the trailing period of 12 months, while the energy index declined 4.8 percent. The GDP and CPI directly affect one another and are two of the most important aspects of a healthy economy. The Bureau of Labor Statistics uses the CPI to adjust important economic indicators such as wages, retirement benefits, and tax brackets. While economic growth is preferred, the U.S. Government can only sustain an annual growth rate between 2.5 to 3.5 percent. If growth rate accelerates so does the inflation rate. Calculated using the trailing 12-month CPI, the current inflation rate is 1.55 percent. U.S. consumer confidence rebounded in February following a tumultuous January. The Conference Board consumer confidence index dropped last month amid worries involving the 35 day-long government shutdown and stock-market volatility, which reflected higher interest rates and paranoia due to trade tensions between the U.S. and China. The consumer confidence index reported by the Conference Board, which measures consumers’ assessment of current economic conditions and forward-looking expectations, rose from 121.7 to 131.4 in February, following a rally in the stock market and a positive outlook regarding current trade talks. The February Manufacturing ISM report announced a PMI at 54.2 percent. The PMI, or Purchasing Managers’ Index, is an indicator of economic health for manufacturing and service sectors. The PMI is released monthly by the Institute of Supply Management and provides information to company decision makers, analysts, and purchasing managers about current business conditions. It is also based on a survey, consisting five major areas: new orders, inventory levels, production, supplier deliveries and employment, gets sent out to senior executives at over 400 companies. A PMI reading above 50 percent indicates that the manufacturing economy is generally expanding, while a reading below 50 percent indicates contraction. Typically, a PMI reading above 42.9 percent, over a period of time, indicates expansion of the overall economy. While the February reading was the lowest recorded in the past 12 months, it still represents growth in the manufacturing sector for the 30th consecutive month, and growth in the overall economy for the 113th consecutive month. Total payroll employment increased by 304,000 in January, while to unemployment rate edged up to 4 percent compared to the previous month’s 3.9 percent. That being said, average hourly earnings of all private-sector employees rose over the month, following a 10-cent gain in December. Over the past 12 months, hourly earnings have risen a total of 3.2 percent. We saw the largest employment increase of 74,000 this past month in the leisure and hospitality industries, with the smallest change seen in government employment, showing an increase of only 8,000. In brighter news, the employment-population ratio – the proportion of the population that is employed – is now 19.1 percent among those with a disability, as reported by the U.S. Bureau of Labor Statistics. This shows a .4 percent increase from last year’s employment-population ratio among disabled people in the U.S. Among disabled persons aged 16-64, this ratio rose 30.4 percent in total in 2018. All in all, the health of the U.S. economy is making a steady comeback from the recent lows hit in the last quarter of 2018. Looking ahead, we plan on seeing continuous mature growth throughout the remainder of the year, stabilizing the overall economy. Keep an eye out for updated GDP estimates for the fourth quarter, based on more complete data, being released on March 28th. As students, some of us may be in a constant state of frenzy over whether our careers will be overtaken by robots. Well, the plague has officially began overtaking the healthcare industry as we know it. Every year more than 4,000 people are injured undergoing surgery due to human error. Surgeries, specifically spinal implant procedures, leave patients with severe bleeding and long recovery times. In fact, post-surgical pain is oftentimes reported as being more severe than it was pre-surgery. But with the assistance of robots, we can actually begin to improve the efficacy of surgeries and post-surgical pain. Robots are much more precise and require smaller incisions to complete procedures. This does not mean that humans are not involved in the process. Surgeons are sitting behind computer screens and monitoring the procedure using a video camera attached to the robot’s arm, and controlling the robot as needed. Companies such as Intuitive Surgical and Globus Medical are streamlining efforts to be at the forefront of creating robots that aid in such minimally invasive procedures. While procedures such as breast mastectomies (removal of breast tissue) and hysterectomies (removal of the uterus) are still preferred to be done by humans, robots are beginning to take over spinal surgeries entirely. The spinal surgery market is going to be driven by the fact that people require more spinal implants. As countries are becoming more industrialized, sedentary lifestyles are becoming more prominent due to bad posture from sitting all day. Because of this, 20% of Americans develop scoliosis, which oftentimes requires spinal implant surgeries. Additionally, the world population is aging. The number of people over 65-years-old will exceed the number of people below 18-years-old by 2035, which is truly a never-before-seen feat. Due to the rise in aging population, chronic back pains have risen by 24% in the past decade, as spinal problems are age-related. As more people are opting for spinal surgeries, the rise in artificial intelligence will aid in broadening the applications of robots for minimally invasive procedures. The $60B artificial intelligence market is the root cause of software developments that allow for a robot to acquire a human-like brain during operations. As of 2017, the number of surgical procedures rose by 15% globally, due to people’s increased trust of and declining fear of surgeries. And for this, we can thank the robots for inducing the minimally invasive procedures. The main risk factor in the robotic space is the slowing usage of robots due to the lack of surgeons able to be overlook the surgeries. It’s argued that more surgeons will be required to be present at surgeries when robots are handling the procedure, as more human brains need to be attentive to what’s happening behind the robot’s movements. Utilizing such equipment in the surgery room also requires extensive training. However, companies such as Global Medical having simplified training programs in place to make sure that robots really are the face of the future. After the -19.78% correction in the last two months of 2018, market has turned around its performance in the first quarter of 2019. S&P 500 recorded best January performance in history and its year-to-date return stands at 11.26%. The correction that ensued near the end of 2018 was caused by slew of worries. Investors fear over hawkish tone of Federal Reserve monetary policy, escalating trade tensions with China, synchronized global economic slowdown, and concerns over a potential earnings recession in 2019 were some of the suspects behind the panic. The market has regained much of what it lost during the correction in part due to better than expected earnings reports and sudden change in tone of Federal Reserve Chair Jerome Powell during his latest press conference where he backed off from running the balance sheet normalization on autopilot. Even though president Trump recently announced that he is postponing the additional tariff hike by 60 days, the threat of unresolved trade policies still looms large. At +17.71%, Industrials (XLI) is the best performing sector. Boeing (BA) is the biggest contributor with the stock up 22.05% after a record Q4 earnings. They beat EPS estimate by 19.9% on the back of $28.30 billion revenue and raised expectations for airplane sales to 905, up from 806 last year. This signals strong growth for air travel, despite the world bank cutting its 2019 growth forecast due to trade tensions and currency woes. Railroads have also been performing incredibly well. CSX, NSC and UNP added a total of 2.3% of XLI’s YTD gains. Although railroads had incredible gains for 2019, they faired poorly in the last quarter of 2018, due to tensions between China and the US. However, recent data shows that rail traffic has held up well, with carloads up 1.7% from January 2018 and intermodal originations up 1.1% showing continued strength in the industry. All three companies have beat Q4 EPS and revenue expectations. The technology sector, (XLK) is up 13.90% with biggest contribution from Microsoft (MSFT) who reported 76% growth in could service segment, Azure. In the process, Microsoft took over the crown of most valuable publicly traded company on market capitalization basis at $856.1billion. Other big contributors are the payment processors, Mastercard (MA) and Visa, adding a total of 1.36% to XLK. Mastercard reported a gross dollar volume of $1.55T an increase of 14% YoY with Visa reporting a similar outcome with an increase of 11% in payment volume. Energy (XLE) is up 12.45% for 2019 with Exxon Mobile (XOM), Chevron (CVX) and Phillips 66 (PSX) adding a total value of 6.16% to XLE. These increases are backed by an increase refining margins and and production. Consumer Staples (XLY) posted a total of 11.38% in gains for 2019, backed by Amazon (AMZN) and home improvement retailers like Home Depot (HD) and Lowes (LOW). Amazon has only returned 8.72% this year underperforming markets, but due to its weighting in the ETF (21.54%), it has added by far the most value to XLY with 1.93%. Much like Microsoft, the most impressive number was the cloud service performance which is up 46% YoY and brought in $7.92 billion in revenue. Financials (XLF) underperformed the overall market in 2018 and continues to do so, posting only 10.16% YTD. Worries about raising interest rates has plagued the industry but the fundamentals are still strong. Bank of America (BAC) reported strong Q4 earnings with 52% increase in consumer banking net income and 42% increase in global wealth and investment management. Recently BB&T announced that it will merge with SunTrust Banks for a $28.2 billion in an all stock deal to create the sixth largest bank in the United States by deposits. The two Banks were having a difficult time competing with larger banks and also wanted to consolidate their tech spending which they desperately need in order to serve their customer and compete against big national banks. The merger is expected to be completed by Q4 2019 and create an annual cost savings of $1.6bn by 2022. After stellar performance in 2018 Healthcare (XLV) has lagged behind the market, only posting 8.63% YTD. The company with the largest attribution to XLV is Johnson and Johnson with 6.58%. In recent news General Electric (GE) has agreed to sell its healthcare business to Danaher Corporation (DHR) in a $21 billion all cash deal. Some analysts believe that DHR’s organic growth will increase from 4% to 6% due to this acquisition that will be completed in Q4 2019. Danaher is funding the acquisition with an offering of $1.35 billion worth of common stock and an additional $1.35bn of Series A Mandatory Convertible Preferred Stock. As the era of historically low rates ends, the Banking sector is now facing geopolitical headwinds, trade uncertainty, and overall market fragmentation. However, despite external pressures, the commercial banking industry maintains a positive outlook as strong fiscal spending and temperate inflation in the current climate will slow down the flattening yield curve and boost demand for credit. The health of the economy is tied to the performance of the banking sector. While there are concerns about the flattening yield curve, the Fed’s sudden dovish outlook hints at the continued credit growth in 2019. We are also continuing to reap benefits from the recent tax cut in 2018 and President Trump’s increased fiscal spending. Given the subdued interest rate environment, prudently expanding loan books and establishing a robust digital banking platform are the primary drivers of growth in the banking sector. Throughout 2018, the rising rates helped banks increase profits in the consumer and commercial banking segment as the spread between the rates they offer to savers and the rate they lend widened. During this period of rising rates, the average net interest margin for all US banks increased by 6% from 3.15% to 3.33%. In conjunction, credit card debt also increased to 19.3% from 18.4%. Although the Fed may hold off raising rates in 2019, the trend of accumulating deposits and increasing loan book size will be fueled by the improved credit demand in the economy. Another trend that’s fragmenting the entire industry is the rise of FinTech. Early adopters of digital banking such as JP Morgan Chase & Co and Citizen’s Financial Group have been able to penetrate the millennial market and expand their geographical deposit footprint. On the other hand, the majority of full-service banks must now decide between investing in horizontal integrations to strengthen their value chain to combat the new entrants or unbundle their consumer banking services to the new FinTech entrants. At the same time, the FinTech trend has also increased the importance of branding and increased cost savings as brick and mortar locations are slowly phased out. Geopolitical uncertainty from Brexit and the overall economic instability of the EU’s banking system is another considerable risk to the entire banking sector. While US banks are all unified under the Central Bank, the European banking system lacks a central authority regulatory agency. As a result, Brexit could lead to a free-fall of the British pound and disrupt the entire EU economy. The ongoing trade uncertainties also affect banks with international exposure such as Citi. However, we should keep in mind that external pressure ultimately doesn’t undermine or change the operational structure of a bank. The biggest problem facing M&A activity and capital markets today is the rising cost of debt. While a quarter point hike here and there won’t drastically lower profit margins, the consistent hikes have threatened the balance between servicing debt and reducing the principal. Banks are now seeking financing from foreign markets, which include Europe and India, and financial sponsors to combat the rising cost of debt. Equities were expected to outperform other major asset classes in 2018 as they were to benefit from synchronized global growth and an increase in profits due to the Tax Cuts and Jobs Act passed in 2017. While major U.S. equity indices spent the majority of the year in the green, their gains were erased in December due to a combination of factors. These factors included investor’s expectation of a weakening global macroeconomic backdrop and an unpopular decision by the Federal Reserve to increase their federal funds rate between 2.25% and 2.50%. The federal funds rate is a measure used by the central bank that controls the country’s money supply and in turn, can influence growth. With increasing interest rates, investors were worried that the Federal Reserve was raising rates too quickly and that the economy could overheat. As a result of these developments, major equity indices posted their worst year in ten years with the S&P 500 falling 6.2%, the Dow Jones Industrial Average falling 5.6%, and the NASDAQ falling 4%. In comparison to 2018, 2019 is a year in which analysts expect growth in corporate profits to slow as they have reaped the benefits of the tax cut and will continue to suffer from an increase in expenses due to the ongoing U.S.-China trade war. However, with approximately 50% of S&P 500 companies already having reported 2018 fourth-quarter earnings, major U.S. equity indices have been able to bounce back from their December lows as growth in corporate profits have been better than initially expected. For January, the S&P 500 gained 9.16%, the Dow Jones Industrial Average gained 8.11%, and the NASDAQ gained 10.23%. Although each sector had seen certain companies that failed to meet analyst’s earnings expectations, the following two retail companies have posted some of the strongest earnings for the quarter. Estee Lauder Companies Inc. is one of the world’s leading manufacturers and markets quality skin care, makeup, fragrance and hair care products that are sold in upscale department stores. Currently, Estee Lauder Companies Inc. offer these products under brand names such as Aveda, Bobbi Brown, Jo Malone London, and Tom Ford Beauty. In recent years, Estee Lauder Companies Inc. has been able to benefit from an increase in spending towards discretionary goods as well as an overall trend in which consumers have become more concerned about their image. On Tuesday, February 5, EL released earnings for the quarter in which investors were reassured that the company continues to benefit from the same trends it did a year ago. For the quarter, EL reported earnings per share of $1.86 which is better than last year’s earnings per share of $1.52 and Wall Street’s estimate of $1.54 for the quarter. Additionally, EL’s revenue was reported to be $4.01 billion for the quarter in comparison to the $3.92 billion expected by analysts. The company’s better-than-expected performance was primarily driven by a strong holiday season, increased sales from premium products, and solid results from its Asia-Pacific operations. As a result of this strong quarter, EL has raised their outlook for the first six months of the year and had experienced a 12% gain on the day. Clorox Co. is a $19.6 billion company that manufactures and markets consumer and professional products under notable brand names such as Clorox, Tilex, Glad, Burt’s Bees, and Kingsford. As a company that predominately offers household consumer products, Clorox tends to perform best in times of an economic slowdown as their products are a constant necessity within consumer’s lives. On Monday, February 4, Clorox Co. posted better-than-expected earnings for the quarter that resulted in the company’s shares gaining 6% on the day. For the quarter, Clorox Co. reported adjusted earnings per share of $1.40 which beat analyst’s expectations of $1.30. The company’s increase in profitability was driven by a greater-than-expected decrease in costs under the company’s cost-cutting plan. Similar to Estee Lauder Companies, Inc., Clorox Co. increased their guidance for the year as the company expects to continue cutting costs under their current plan. With Estee Lauder Companies Inc. and Clorox Co. posting better-than-expected earnings for the quarter, investors who are bullish on the retail sector have been provided with a glimpse of what can be expected from future earnings releases in the coming weeks. According to Aristotle, there is a fundamental irreconcilable split between the world’s process of being and becoming. Being connotes the part of nature that is static while becoming points to the ever-changing fluidity of the world. Today, in the technological era, our process of being, in terms of industrialization, has ended and our process of becoming, in terms of digitalization, has begun and is accelerating faster than ever. The global expansion of the web has flattened our world and made us more connected than before. This February, during the NFL’s 52nd Super Bowl, the Philadelphia Eagles beat the New England Patriots 41 to 33 in front of 103.4 million viewers from across the globe. American Football is the most viewed sport in the U.S. and has lost 7% of its total average users since 2017. In the meanwhile, the League of Legends World Championship Finals held on October 21st, 2018, was able to garner a total of 200 million viewers worldwide. The up and coming Electronic “Sports” market is taking the world by storm and has already gathered crowds larger than those within some tradition sports leagues. According to Statista, the eSports market is expected to generate $905 million in revenue by the end of 2018 and $1.65 billion by the end of 2021; the sector is expected to grow at a CAGR of 38%. Currently, about 80% of this revenue is coming from sponsorships and advertising and the other 20% is coming from eSports betting, prize pools, tournament ticket sales, and merchandise. Companies like Activision has already generated nearly $1 billion in revenue off capitalizing on the eSports trend by selling off 12 Overwatch teams last year to sports team owners/supporters across major cities. This start-up Overwatch league has been a huge success so far, generating lots of money across multiple different tournaments, and will set them up next wave of team sales at higher prices. Take-Two Interactive Software also capitalized on this growing eSports trend by creating an NBA 2K League, where 17 of the 30 NBA teams would be represented. Aside from the gaming companies, traditional technology giants have also been plotting plans to enter into the lucrative eSports market. Companies like Amazon acquired streaming platforms such as Twitch in 2016 in order to tap into the eSports market. Now, Google and Microsoft have recently announced efforts to let people play big-budget, visually complex games on internet connected devices without them having to spend too much on devices such as Xbox or PCs. The game-software sector revenue rose 59% since last year to $121.7 billion and is expected to reach $134.9 billion by the end of the year. Game-Software growth and eSport’s market growth carries huge growth opportunities for other parts of the tech industry as well. Demand for cloud and high-speed internet connection is expected to increase as a result of eSports because of the need to constantly integrate data at lighting speeds. During tournaments, a delay of even a quarter of a second can heavily skew the outcome of a game being players. This will accelerate demand for 5G networks once telecom companies start to role it out. Also, increased demand in gaming and 5G networks will also increase the demand for semiconductors which will benefit companies with Advanced Micro Devices and Nvidia. The semiconductor manufacturing industry is currently generating a revenue of $54.6bn with an annualized projected growth rate of around 2.2% per year over the next 5 years according to IBISWorld Research. Monthly Market Review: Is the Worst Behind Us? October was a turbulent month as the market faced major headwinds that brought down all three major indices for a second time this year. The S&P 500 fell close to 10% correction territory at -9.25% before closing the month at -7.23%. Though some components of the Dow Jones Index such as 3M Company and Caterpillar reported disappointing earnings and gave gloomy guidance, the overall index held up much better than its peers. Strength of the rest of the components such as Unitedhealth Group, McDonald’s, Boeing, and Apple neutralized the weakness. It was down -8.23% before recovering to close the month as -5.77%. The worst performing index was NASDAQ 100 as it crossed below the 10% correction territory at -12.28% before recovering and finishing the month at -8.78%. We think that the China trade war rhetoric from the Vice President Mike Pence, rising yields, suspected peak earnings growth and profit taking kicked off the initial sell-offs with disappointing earnings report by major technology companies exacerbating it further. From a macro perspective, the United States posted strong economic report with third quarter initial GDP reading coming in at 3.5% driven by consumption. The unemployment rate hit 49-year low of 3.7% and the monthly YoY wage growth came in nine year high at 3.1% as the labor market continues to tighten. As the economy marches ahead with all 12 cylinders, this raises the fear of an overheated economy and its implication on the federal reserve monetary policy. The fed announced three rate hikes so far this year and if the economic indicator continues to print strong numbers, we could potential get another rate hike announcement during December meeting because of inflation fears. Currently, the CME Fed Funds Future is pricing in a 76.6% probability of a 25-bps rate hike during the December meeting which will raise the federal funds rate range to 2.25% to 2.50%. Oil prices dropped significantly over the month. The United States WTI benchmark fell 13.27% and the international benchmark Brent, fell 11.19% from an $86 per barrel high at the beginning of the month to a 7-month low of around $75 at the month’s end. This drop was primarily due to U.S. stockpiles increasing for the 6th week straight given the expectation for an inventory drawdown because of falling Iranian crude oil export due to reinstatement of sanctions. ExxonMobil (XOM) saw its stock price jump after posting its highest Q3 profits in four years, and seeing revues rise 57%. Chevron (CVX) also saw its stock rally after posting positive quarterly results, including setting a new daily barrel production record of about 2.9 barrels, and nearly doubling its production in the Permian Basin. UnitedHealth Group, one of the largest healthcare providers in the U.S., posted impressive earnings with EPS beating by 3.91% and revenue exceeding consensus expectations by 12%. The Group also raised guidance for Q4 2018, citing synergies in Optium as a primary reason. Despite the positive earnings, the stock dropped down 4.12%, reflecting the cautious attitude currently surrounding the markets. Johnson and Johnson (JNJ), the largest drug manufacturer in the S&P 500 reported its EPS beating expectations by 0.02, and revenue growth of 3.5%. The company cited robust a pharmaceutical growth of 6.7%, which was slightly offset by the floundering medical device segment shrinking 0.2%. Boeing reported strong EPS and revenue growth which came in above consensus and raised guidance for Q4. Boeing showed 12% growth in its Global Services, and Space & Security segments making up for declining commercial aircraft sales. Boeing’s performance indicated that tariffs have not impacted all manufacturers. This was further supported by the fact that “tariff” was never mentioned during its earnings call. 3M told a very different story with Q3 EPS missing estimates by 4.65%, revenue shrinking by 0.2%, and guidance being lowered for the future. Reportedly, the implementation of tariffs reduced earnings by 15 cents per share, and 3M management stated future product pricing will offset the higher material costs. Despite tariff impacts, 3M’s main setback was the headwinds from currency volatility, which resulted in a 1.7% reduction in revenue. Facebook report beat EPS by 19.10% but missed on revenue growth. The metrics currently catching investors’ eyes are revenue growth (the slowest to date) and daily/monthly active users (currently stalling). Some see slowing revenue and user growth as an indication of the company reaching maturity which could signal rough roads ahead for the social media giant. Alphabet, the parent company of Google (GOOG), beat EPS by 25.5%, however like many other companies this earnings season, it fell short on revenue growth. Alphabet cited growing traffic in total searches, Youtube engagement, and cloud services. GOOG reported large growth internationally as well as domestically. U.S. revenues were up 20% year-over-year, EMEA up 20% year-over-year, APAC up 29% versus last year and Other Americas were up 19% year-over-year. Blackrock (BLK), the world’s largest asset manager, beat EPS estimates by 10.10%, however missed revenues by $60mm. In Q3 the asset manager posted its first net capital outflow since 2015, announcing a $3.14bn exodus, compared to last quarter’s inflow of $20bn. The vast majority of this outflow was corporate and not individual investors, signaling that companies are reconsidering their cash investments as a rising interest rate environment seemingly approaches. BLK declined 30% from its highs earlier this year. The Energy Industry is a multi-factor industry that is not only affected by the performance of companies but the price of the commodity that is used by many companies within the industry. The global benchmark is Brent Crude, and the U.S. benchmark is West Texas Intermediate or WTI. The price of Brent and WTI have rallied since the crash to $30 a barrel but have recently undergone some strain. The rally was in part due to OPEC’s de-facto leader Saudi-Arabia working with Russia to put supply cuts. That combined with geo-political tensions including the death of Jamal Khashoggi at a Saudi-Arabian embassy in Turkey and sanctions announced on March 12th on Iran who exports nearly 3.5 Million barrels per day, have brought Oil futures to new 4-year highs. Oil demand is strongly correlated to GDP as it is inferred that as GDP increases, output has increased meaning a need for oil. We can see GDP globally being threatened specifically with South Korean GDP only expanding by 0.6% missing the expected 0.7% for Q3. The recent slow-down of the global economy has sent shocks to the price of oil. From the beginning of October, Brent is down 10.71% and WTI is down 12.48%. With the Federal Reserve set to raise interest rates again in December and planning three more hikes next year we see that the decade long bull run may be slowing down. There is also a rise in the U.S. dollar index of 1.44% hurting demand for dollar denominated oil futures. Most recently we’ve seen that Russia has weaned off its supply cuts and has no intention of freezing or slowing output levels with fear of undersupply combined with China and India looking to circumvent U.S. sanctions on Iran allowing for higher oil supply and hurting futures. The U.S. has had a surge in oil production because of their ability to Frack. This allows them to drill multiple wells horizontally instead of one well vertically, allowing for more oil production per well. This practice has enabled the U.S. to surpass Russia as the largest oil producing nation. The largest area for fracking is the Permian Basin, an oil field in West Texas, second only to the Ghawar oil field in Saudi Arabia in production. This has come with some issues. The Permian Basin’s rapid increase of oil production to 3,496,000 barrels per day was not accompanied by an increase in capacity from oil pipelines which move oil to refineries to be turned into usable products. This has caused a supply glut in the Permian Basin forcing Upstream or E&P companies to sell their oil at a discount or transport it by rail hurting earnings. Refineries have benefited from this by acquiring oil at a discount boosting earnings. Refineries in Northern United States are also currently getting their oil at a discount from Canada. As Canada is a large oil producing nation that does not have enough refineries, drillers there sell their oil at huge discounts currently around 60% to American refineries. After the market wide correction towards the beginning of 2018, a majority of the market has been able to recoup its losses, and even extend gains, the story is quite the opposite for homebuilders. ITB, a homebuilder iShares ETF is currently off 33.74% from this year’s highs and continues to edge lower. The decline in homebuilders can be attributed to an amalgam of factors, but the rising of interest rates has been the main driver. After the fed approved the first interest rate hike of 2018 on March 21st 2018, homebuilders have reacted adversely to the news, and for good reason. As interest rates rise, you see the cost of borrowing follow that as well, causing mortgages to get more expensive and deter homebuyers from bidding on houses. With third rate hike of the year in September and another potential hike during the December meeting, the sentiment surrounding homebuilders will continue to sour. For this sentiment to reverse its path, we need to see moderation in hawkish tone from the FOMC members. Unfortunately for homebuilders, the bad news doesn’t stop at the rate hikes. The current landscape makes for a perfect storm against the industry. The newly imposed 21% tariff on Canadian soft lumber, falling home sales, disappointing earnings/projections and negative analyst sentiment have been weighing down on the sector as well. One of the larger emerging threats to the industry is tariffs on Canadian lumber imports. This will cut into margins and adversely affect future growth projections for many companies. This increase in cost will most likely be transferred to the consumer, causing further increases in the cost of building new homes while discouraging even more homebuyers. This is already being shown in the forecasted cost of US homes, with a projected increase of 6.4% for the next 12 months. The homebuilder industry is incredibly cyclical, and trends are seeming to rhyme with past interest rate hikes in 2007. Once the Fed began raising rates in 2006, the homebuilder etf XHB began its descent, falling 55.4% before the actual market downturn, which started a little more than a year later, in October 2007. The current trend is nearly mirroring the past tightening cycles, slowing projected job growth and the increasing frequency of disappointing earnings by companies within the sector. The homebuilding sector may seem relatively isolated, but it is quite the opposite. The industry is vast and has incredible influence over a sizeable amount of companies, including home inputs like Mohawk, Sherwin Williams, Masonite, Scotts Miracle Grow and Home Depot. Companies within XHB or ITB also have a huge impact on many raw material companies across America. A decline in the housing sector could mean trouble ahead for the rest of the markets. Although the future for the homebuilding sector looks bleak, some analysts believe that there may be a sweet spot in home builders. The super-affordable segment, consisting of LGI Homes (NASDAQ: LGIH) (avg home 220,000-230,000), NVR (NYSE: NVR) and Meritage Homes Corporation (NYSE: MTH) seems like it may have some value left, considering its more affordable price range. The bottom line here is that home sales are declining because of rising prices driven by declining inventory of for-sale home due to “mortgage rate lock-in”, rising cost of raw materials due to the trade war, and rising cost of mortgage due to federal reserve rate hikes. As the geopolitical landscape continues moving with uncertainty and the world is entering a phase of heightened technological development, a constant focus is on the aerospace and defense sector. As a whole, the A&D (Aerospace and Defense) industry strengthened in 2018 as revenues increased by 7.65%, almost quadrupling last year’s 2.1% growth. Events such as the political dispute between the United States and China pose security threats for many involved governments. In response, the United States government has signed the omnibus spending bill, which set the Department of Defense’s budget at $700 billion, about a 20% increase in two years. As a whole, Deloitte analysts expect a growth in global defense spending at a CAGR (compounded annual growth rate) of 3.0% from 2017-2022. Tensions in developing countries such as India also factor into this continued growth, which shows little signs of slowing down. As cyber threats continue to evolve, there is also a greater need for cybersecurity to help companies protect their clients' personal information. Therefore, global cyber security spending is expected to grow at an annual rate of 10.2% to $248.26 billion over the next five years. At the moment, the aerospace market is dominated by large key players, such as Airbus and Boeing, which control a combined 92.4% of the commercial aircraft market. Growth in the aerospace industry is fueled by a rise in the middle class, which is estimated at an additional 140 million individuals annually. This leads to increased capital expenditure in related fields such as air travel, which was accounted for with the record high backlog of commercial aircraft at 14,215 units at the end of 2017. The industry is facing increased demand and is becoming consolidated and efficient in moving forward. Increased global fears of warfare and border disputes and increased trade activity are the primary drivers for growth in the aerospace sector. With the Pentagon pivoting its defense focus towards China, Russia, North Korea and Iran there is a renewed market for aerospace presence in these regions. China is also active in land disputes such as that in the South China Sea, which contributes to the overall security threat in the region. As a result, aerospace defense companies with a large government client base have seen a sharp uptick in their contract flow. Lockheed Martin, with U.S government agencies as its largest client has recently been awarded a $2.9 billion contract for the manufacture of missile warning satellites for the U.S Air Force. This is reflective of the tense political situation worldwide and translates into overall gains for the aerospace defense sector. On the basis of aerospace manufacturing and transportation, the industry is also showing significant signs of growth. Globalization and an increasing reliance on intellectual capital have resulted in businesses and individuals traveling overseas at one of the highest rates in recent years. In total, revenue passenger miles increased 7% in 2017, which is above 6% annual growth for the third consecutive year. As a result, major aircraft manufacturers are looking internally towards agile growth of their processes, as well as key acquisitions in the M&A space to continue innovating. Boeing recently acquired a majority stake in the commercial aircraft arm of Brazilian plane maker Embraer SA for $3.8 billion, effectively thrusting the large American maker into the lower end market of aircraft. The expansion of aerospace company operations through M&A opens up the possibility for increased solutions for large-scale institutional clients, such as governments and private contractors. Furthermore, the opportunity for machine learning and automation in aiding the manufacturing process is a touted possibility in the sector. Drone use for inspection of aircraft wear and tear and inventory management on blockchain systems are just a few examples of the potential for future aircraft production, and these can be potentially implemented into company processes in the coming years. As a whole, the aerospace sector is in the process of entering the next generation of solutions and has a positive forward outlook. Increasing global tensions are driving growth for the defense industry. The U.S and China have recently taken aggressive stances toward each other. Trump imposed multiple tariffs on Chinese goods, with China responding by imposing their own tariffs on U.S goods. Both countries are increasing their defense spending to prepare for a potential war. There is also increased demand for defense and military products in emerging markets. For example, ISIS is a major threat to countries in Africa, such as Syria, Iraq and Afghanistan. These countries are forced to spend money on defense to protect themselves against terror strikes and cyber-attacks. Due to these global tensions, defense stocks will become hot investments for the next 5 years. The leaders in defense are the participants of the Pentagon’s MQ-25A “Stingray” competition. This competition was designed to create the U.S Navy’s first carrier-based drone, with Boeing winning the competition and a $805 million contract to produce four naval drones. The competitors also included Lockheed Martin and General Atomics. Lockheed Martin is the world’s biggest defense contractor and specializes in aerospace defense. General Atomics is a private company that specializes in creating military drones. Another driver for the defense industry is the need for cybersecurity. Cyber-attacks, such as data threats, ransomware and malware outbreaks, can cause critical disruption for unprepared countries. Data breaches have surged over the past years, with digital security company Gemalto reporting that 1.38 billion records were breached in 2016 and 1.9 records breached in the first half of 2017. These data breaches can lead to leaked personal data and identify theft, which has affected 15.4 million consumers. Due to these threats, the cybersecurity market is expected to grow from $138 billion in 2017 to $248.26 billion in 2022. The main attackers are Russia, China, Iran and North Korea, who have been testing destructive cyber-attacks that are aimed toward the U.S and its allies. To combat this, U.S government has invested much of its spending towards companies that can protect them from these attacks. Companies that the U.S has relied on include Booz Allen Hamilton, Palo Alto Networks and CyberArk. Booz protects the government's information through encryption, which has shown to be the most effective way to protect data. Palo Alto Networks protects its customers through next-gen firewalls, and is best positioned among its competitors to experience robust growth in 2019. CyberArk is unique because it actually protects companies from internal threats such as corporate spies or disgruntled employees. As a whole, the defense sector is in the process of heating up as countries have prioritized spending on defense to protect themselves from other countries and cyber-attacks. In conclusion, the aerospace and defense (A&D) industry has experienced significant growth in 2018, with expectations of greater growth in 2019. On the aerospace side, global fears of warfare have caused the government to sign contracts with aerospace securities to protect themselves from outside threats. Due to growing globalization and improved transportation, many middle-classes citizens from emerging markets have travel overseas at a extremely high rate. Finally, major aerospace manufacturers are looking to move into the M&A space in order to attract new clients. On the defense side, global tensions have resulted in a large amount of countries spending money on defense to protect themselves from cyber-attacks and missile/drone attacks. The U.S government has taken many steps to give defense companies new opportunities, such as increasing the defense spending bill and creating competitions between the defense titans to improve technology. Overall, the A&D industry is anticipating the emergence of conflict and new-age technology, and it is well-positioned to reap its benefits. The Consumer Goods & Retail Industry is composed of multi-national companies that manufacture and distribute finished goods and services to consumers. Companies in this industry classify as either consumer discretionary or consumer staples. The consumer discretionary sector deals with companies that experience an increase in demand for their goods and services during times of economic growth. On the other hand, in the consumer staples sector, the demand for a company’s goods and services tends to increase during times of economic contraction. In the past year, the Consumer Discretionary Select Sector SPDR ETF (XLY) outperformed the broader market with a total return of 29.9% in comparison to SPDR S&P 500 ETF’s (SPY) total return of 15.2%. With an improving macroeconomic backdrop in the United States and a strengthening global economy, the consumer discretionary sector should continue outperforming the market while the consumer staples sector should continue underperforming. Over the last few years, consumers are becoming more concerned with their health and the products that they are consuming. Individuals are shifting away from junk food and sugary drinks to premium, organic and all-natural brands. Companies such as PepsiCo, Inc. (PEP) and General Mills (GIS) are in a position where they need to align their product portfolios with consumer’s interests. On the other hand, companies such as Lululemon Athletica Inc. (LULU) and Planet Fitness (PLNT) have experienced an increase in sales and their stock price as a result of this trend. Since the 2008 Global Financial Crisis, per capita disposable income has increased approximately 25% to $14,398.40. With the unemployment rate at the lowest level in almost 18 years and U.S. growth continuing to increase, per capita disposable income is only expected to improve. Companies who offer discretionary goods such as makeup, designer clothing, electronic appliances, and cars should experience increased sales. As a result of recently passed tax reforms in the United States, companies are utilizing repatriated cash to acquire other companies and products. Recently, Michael Kors (KORS) announced the acquisition of Italian designer Gianni Versace SpA for approximately $2.35 billion. By doing so, Michael Kors will be able to improve a product portfolio that already includes the Jimmy Choo brand. We can expect other companies to follow suit as they are looking to offset any risk of a decrease in sales over the next few years. Consumer Goods & Retail companies generate a substantial portion of their revenues in developing regions. With Emerging Market equity and fixed income markets selling off as a result of political and economic instability, companies operating in this region can experience lower sales growth and can face currency conversion risk when reporting sales. The yield curve, which is the difference between the 2-year and 10-year treasury yields, has been an accurate indicator for upcoming recessions in the past. As of September 28, the yield curve is currently at 0.24%, which is almost the flattest it has been since the beginning of the Global Financial Crisis. If the yield curve is an accurate predictor of economic slowdowns, we can expect consumers to shift from discretionary goods to staples in the next few years. In general, the Consumer Goods & Retail Industry is expected to outperform the broader market over the next 1-2 years and to remain neutral in the long term with increasing worries of an economic slowdown. As long as a recession does not occur earlier than expected, the industry tailwinds discussed in this article should outweigh any headwinds. With increasing per capita disposable income, a decreasing unemployment rate, and improving macroeconomic conditions, consumers should be poised to continue shopping at retailers, more specifically, those that offer discretionary goods. Last week the Dow Jones Industrial Average and the S&P 500 reached all time highs as the news about trade discussion between U.S. and China was announced. While the S&P 500 has already passed its January high previously before the last week record high, it was the first time for Dow. On the other hand, the technology heavy Nasdaq 100 Index was held back from taking part in the latest all-time-high by major tech names such as Apple, Amazon, and AliBaba. In the case of Apple, it appears that the comment from President Trump about potential tariff on Apple products pulled the company’s stock lower. Positive economic data on US wage growth has pushed the yields on 10-year U.S. Treasuries note back above 3% as investors anticipate possible further rate increase by the Federal Reserve. Going into 2018, market was expecting 3 rates increase from the Fed. But the slew of recent economic data indicating a robust economy has puzzled the wall street to the point where they are placing a 77.4 per cent probability of a possible rate increase during September meeting. If the Fed did decide to go ahead and hike the rates in September on top of another hike in December, this will the first time since 2008 where Fed has moved the benchmark interest rate more than four times. Oil price jumped more than 2% to hit its highest since November 2014 at $80.94. Traders are speculating a supply gap from the renewed U.S. sanction on Iran after Saudi Arabia and Russia ruled out any immediate production increase. According to BNP Paribas oil strategist Harry Tchilinguirian, this supply gap will be resolved through high oil prices. This is a heavy blow to President Trump who has called for action to raise global supply. There is a new sector in town called Communication Services and it includes high profile names such as Netflix, Google, Facebook and smaller names such as Twitter. According to Reuters, “The telecom sector, currently about 2 percent of the entire S&P 500 is expected to have a roughly 11 percent weighting under its new communication services tag”. Not all high-profile names are moving into this new sector with Amazon and Apple remaining in their old sectors. This latest shake up of the Global Industry Classification Standards (GICS) reflects the rapidly evolving global economy and the role of technology in our future. A rising advance-decline line (a technical indicator measuring the number of advancing stocks less the number of declining stocks). 27% year-over-year earnings increase and 11.2% sales growth in the S&P 500 since 2010 and 2011, respectively. The fear of an impending trade war sparked by President Trump's tariff and trade balancing measures. The U.S. Federal Reserve's decision to follow through with rate hikes going into 2019. Emerging market countries tend to run account deficits and rely on foreign capital to fund these deficits. When the Fed raises rates, ‘carry trade’ becomes increasingly expensive and less attractive to investors. Currency woes across the globe. As of now, the mayhem in emerging market seems to be contained, heavily impacting the countries depending on overseas money. Some of these affected countries include South Africa, with the Rand down 19.43%; Argentina, with its Peso down 52.70%; Turkey, with the Lira down 43.23%; Brazil, with the Real down 20.37%; and India, with the Rupee down 11.03%. As these currencies tumble further, governments frantically try to halt, or at the very least decelerate the fall. For example, the Turkish Government increased regulations on foreigners shorting the Lira, the Brazilian Central Bank offered 15,000 currency swap contracts in an effort to reduce volatility, and the Argentine Central Bank raised rates from 45% to 60%, in addition to requesting a speeding up of the $50 billion bailout from the International Monetary Fund. Despite all these proactive measures, currencies continue to falter against the U.S. dollar. Even though the US market is performing well, the Federal Reserve's effects on emerging market currencies has highlighted international dependence on the USD. Worries are now shifting to EM contagion as higher bond yields and expensive debt (caused by the Fed’s rate hikes) could possibly shift currency flow out of emerging markets, hindering local economies and international trade. Some of these effects have already been highlighted in the most recent Institute for Supply Management survey, indicating that America’s factory activity is at the highest level since 2014.